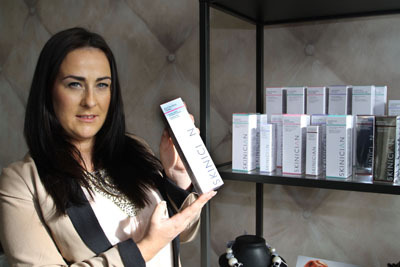 A new top of the range hair and beauty unisex studio has opened it doors in Saintfield. Carvalho Hair and Beauty provides a wide range of ladies’ and gentlemen’s services. They want to not only look good but feel good too. Carvalho proprietor Grainne Byrne shows off some of her proprietary products in her unisex hair and beauty salon in Saintfield. Proprietor Grainne Bryne who has over 10 years experience mastering hair care and styling, is looking forward to welcoming her new and old customers into a bright and cheery premises elegantly decorated reflecting both modern and classic styles. The two-story property saw a full renovation and everything down to the last detail in décor has been attended to provide a highly polished but relaxing atmosphere. The ground floor is dedicated to hairdressing where Grainne with highly experienced hair stylist Lyndon Steele will be assisting, and on the lower flower, beauty treatments are available such as tanning, waxing and facials. Grainne said: “Our aim is not to create styles that are very loud but one’s you feel comfortable with. We have tried to keep our prices in the affordable bracket. We want to work with our customers in a friendly atmosphere and if we make them feel better and happier then we feel we have succeeded. “We use quality products that are supplied by top brand Schwarzkopf. Our hairstylists take the latest training sessions with them keeping us all up to speed with the most modern trends and techniques. “Schwarzkopf are leaders at the front of the hair and beauty industry. Our quality products also include the Skinician range and these will make all the difference to give you that extra bounce. “Carvalho offers a wide range of hair styles such as highlights, colouring, up styles, cut and blow dry, and we do formal packages for those special events such as weddings. We cover all ages and sexes and also work with people who have experienced hair loss for various reasons through health problems. 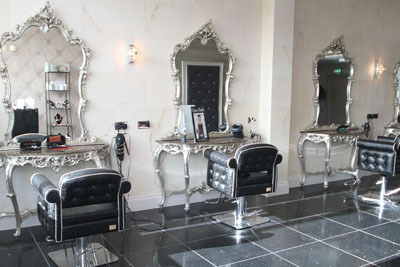 The interior decor at Carvalho Hair and Beauty in Saintfield reflects a mixture of classical and modern styles. 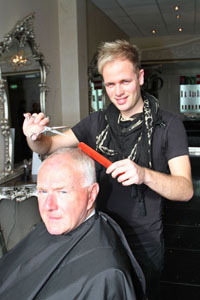 David McNarry MLA, Carvalho’s next door neighbour in Saintfield, with hair stylist Lyndon Steele. Wednesday, Thursday, Friday – 9am – 9pm. 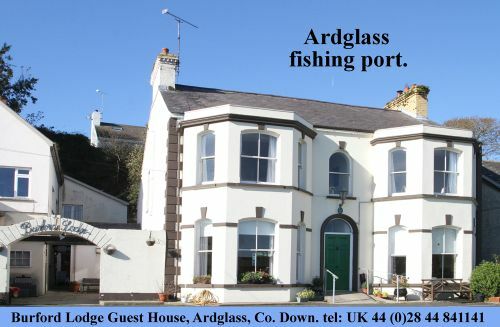 Tel No: 028 97 511244.